We wish to invite you to visit Honduras, a Central American country in the very heart of the Americas. 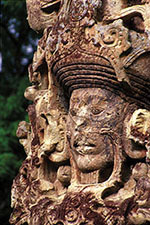 Honduras has a monumental archeological site in the western part of the country, Copán. This famous Maya city is an important ceremonial center and one of the leading scientific centers of the Classic Maya period, used as an astronomical observatory. It flourished during the 7th century of our era and is representative today of what Athens is to the old world. For its rich architecture and iconographic, UNESCO declared Copán a World Heritage site in 1980. Therefore, I reiterate my invitation for you to invest in Honduran Tourism and enjoy visiting our beautiful country.